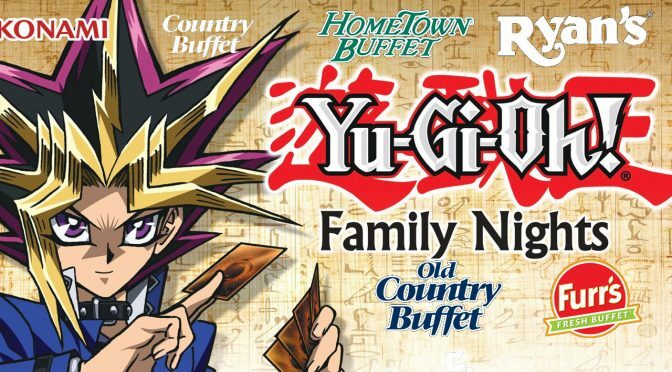 SAN ANTONIO, July 5, 2018 /PRNewswire/ — Ovation Brands’® portfolio of restaurants – Old Country Buffet®, Ryan’s®, HomeTown® Buffet and Country Buffet® – and Furr’s Fresh Buffet® are celebrating all things Japanese with their latest Family Night, featuring the internationally popular Anime brand, Yu-Gi-Oh! The six-week program will include weekly themes centered on the series that has been adapted to a variety of mediums. Family Night is every Thursday from 5-8 p.m. Activities may vary by location. Yu-Gi-Oh! began as a manga in 1996 but was later adapted to a number of forms, from anime, to a widely successful trading card game, to the hit mobile app Yu-Gi-Oh! DUEL LINKS, and of course, feature films. Yu-Gi-Oh! 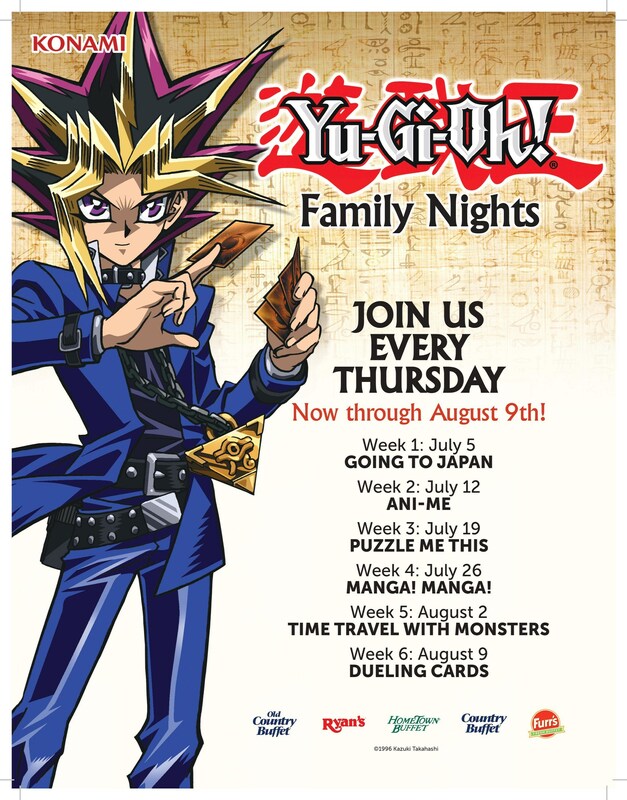 features its main character, Yugi Muto, a heroic boy who, after solving an ancient puzzle, is able to solve conflicts through the trading card game with his alter ego Yami Yugi. July 12 – Manga! Manga! The Yu-Gi-Oh! Family Night will also feature a giveaway. The grand prize is a Yu-Gi-Oh! Prize Pack, which includes one Yu-Gi-Oh! TCG Kaiba’s Collector Box and Starter Deck: Link Strike. In addition to kid-friendly fun and games, Family Night also serves up home-style meals for guests. Every Thursday from 4 p.m. – close, kids eat for just $1.99 with the purchase of a regular-priced adult or senior meal. Menus may vary. Age restrictions apply. For more information about Family Night, visit www.Ryans.com, www.HomeTownBuffet.com, www.CountryBuffet.com, www.OldCountryBuffet.com or www.Furrs.net. KONAMI is a leading developer, publisher and manufacturer of electronic entertainment properties and traditional trading card games. KONAMI’s software titles include the popular franchises Metal Gear Solid, Silent Hill, DanceDanceRevolution and Castlevania, among other top sellers. KONAMI is also the manufacturer of the wildly popular Yu-Gi-Oh! TRADING CARD GAME, which has sold more than 25 billion cards worldwide. The latest information about KONAMI can be found on the Web at www.konami.com. KONAMI HOLDINGS CORPORATION is a publicly traded company based in Tokyo, Japan with subsidiaries, Konami Digital Entertainment Co., Ltd. in Tokyo, Japan, Konami Digital Entertainment, Inc. in the United States and Konami Digital Entertainment B.V. in Windsor, the United Kingdom. Details of the products published by KONAMI can be found at www.konami.com. Ovation Brands currently operates 98 restaurants in 30 states, principally operated under the Old Country Buffet®, HomeTown® Buffet and Ryan’s® brands. Furr’s Fresh Buffet currently operates 21 restaurants across four states. Visit www.Ryans.com, www.HomeTownBuffet.com, www.CountryBuffet.com, www.OldCountryBuffet.com or www.Furrs.netfor more information.